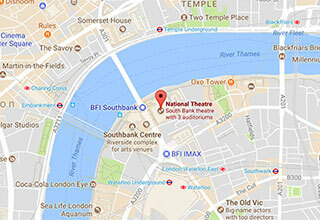 Friday Rush offers a great way to get hold of National Theatre tickets at late notice – even for sold out shows. Every Friday at 1pm an allocation of £20 tickets for shows in all three theatres* at the National is released to buy online, for the following week’s performances. Friday Rush tickets are only available to book online and limited to 2 per customer for each show. Friday Rush tickets are not transferable. They can only be collected from the Box Office on the day of the performance from 90 minutes before the start of the show and you will have to show the card you paid with on collection. When the timer below counts down to zero at 1pm on Friday 26 April, £20 Friday Rush tickets will become available for perfomances from Monday 29 April to Saturday 4 May for Small Island, Top Girls and Tartuffe at the National Theatre. If you are based in a different time zone to GMT/BST, please be aware that the timer may reflect your time zone and not GMT/BST. The timer is currently unavailable. The Friday Rush tickets linked to below will only be available on the date and time specified above.